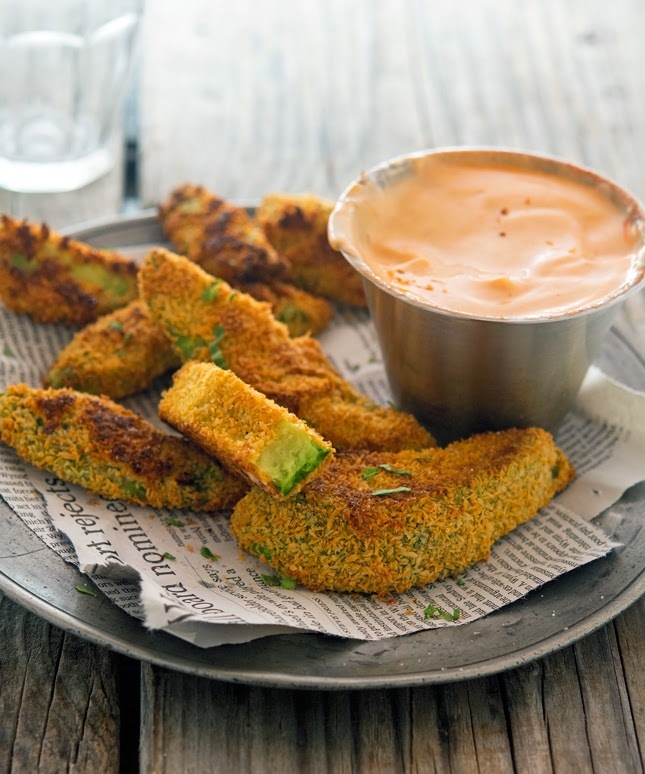 If you have never tried avocado fries before (just like my sis), you totally should. In my opinion, seasoning in the coating is necessary to pump up the flavor. It’s not like they’re short on flavor on their own, but seasoning adds that certain je ne sais quoi. Coat them in shredded coconut in lieu of of breadcrumbs is not just a paleo/GF thing. You probably won’t believe me, but you should. 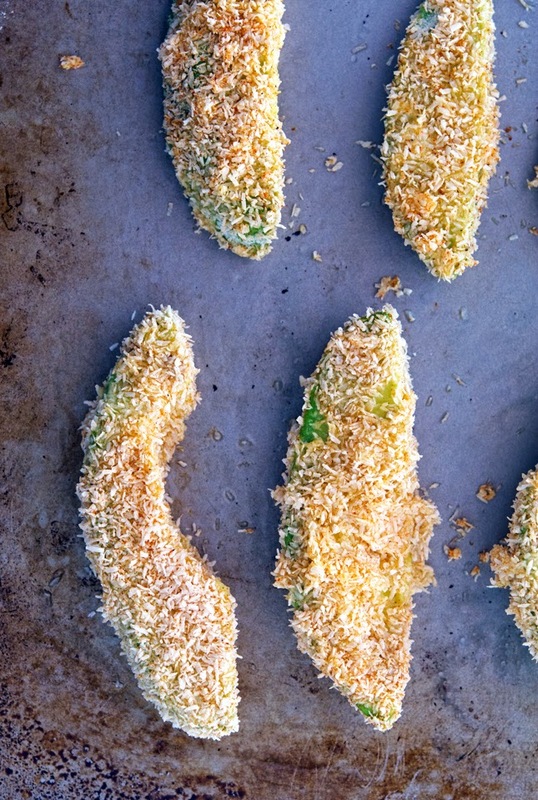 Avocado fries go from a ten to an eleven when coated in coconut. But if you want to stick with breadcrumbs, do it. I won’t judge you, I promise. Whatever you do, I think you need a dip. I elected to make mine Sriracha Mayo — because I honestly think it’s phenomenal — but feel free to do pretty much anything you’d ever associate with guacamole. One last thing, you do want to serve these warm and fresh. Just like French fries, they are not as good reheated so might as well eat them all. Just like my sis did. She tried ‘em, loved ‘em, and now is a convert. The plan has been successful. Coconut Crusted Baked Avocado Fries with Sriracha Mayo Print this recipe! Preheat oven to 425°F (210°C) and place a rack in the middle. Line a baking sheet with aluminium foil and set aside. Slice the avocados in half, and carefully remove the pit. Cut each half into 5 slices, and set aside. In a bowl combine arrowroot powder and half of the seasonings in a bowl. In another bowl combine egg and water. In a third bowl combine shredded coconut and the remaining half of the seasonings. Working quickly, dip the avocado slices in the arrowroot mixtures, then in the egg mixture, and then in the coconut mixture to coat well. Place coated avocado fries on the lined baking sheet. Bake in the hot oven for 10 to 12 minutes, then flip and bake on the other side for 2 to 4 minutes. To make Sriracha mayo, in a bowl combine, mayo, Greek yogurt, Sriracha, lime juice, and pepper and stir to combine. Taste and adjust seasoning if needed. Serve with baked avocado fries. 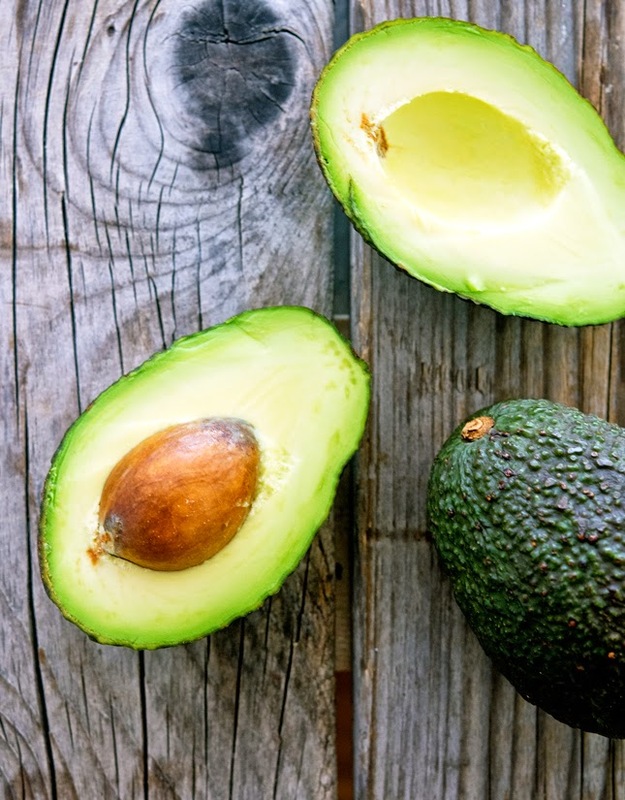 One avocado fry yields 64 calories, 5 grams of fat, 4 grams of carbs, and 1 gram of protein. I might be over thinking this BUT - in the picture (the one with a half bitten fry) it looks like you didn't take the skin off. Am I right or has it just been a really long week and now I'm seeing things that can only be cured by a batch of these fries? I took the skin off, trust me. I think it's just the outer part of the avocado flesh that's darker than the one closer to the pit. BTW, I'm sorry to hear you had a long week. I hope you'll have a relaxing weekend! Mines came out so good! Mike - your photos are usually stellar - but, darn duuude - these are freakin fantastic - or should I say awesmazing! 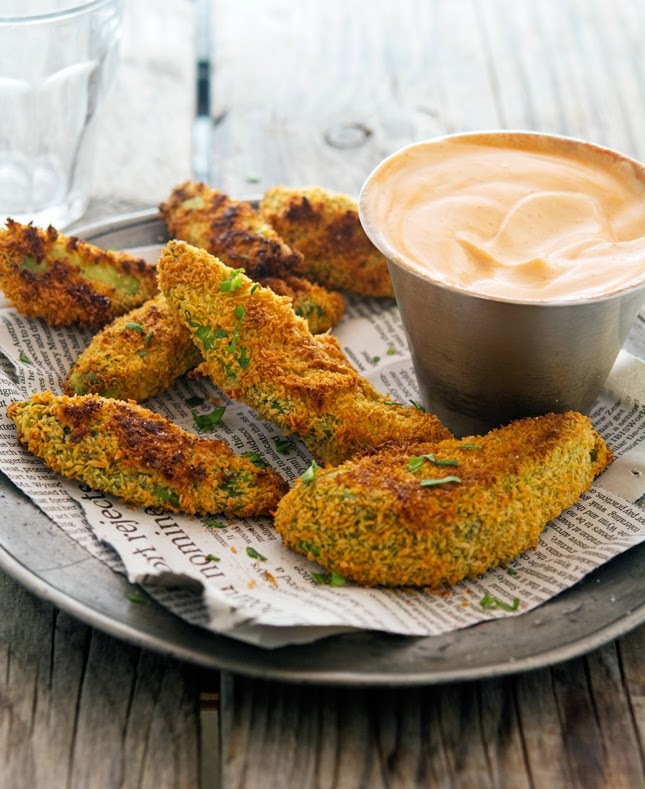 I adore avocado fries and I must say, that coconut coating and paprika take these to a whole other level indeed! Happy Friday! You have a knack of making me want to try things I've already dismissed (I actually ate zoodles this week and they weren't as horrible as I remember, lol). I tried raw avocado fries once and didn't really dig them, but these with the combo of coconut and baking look pretty irresistible! :-) Have a great weekend buddy! 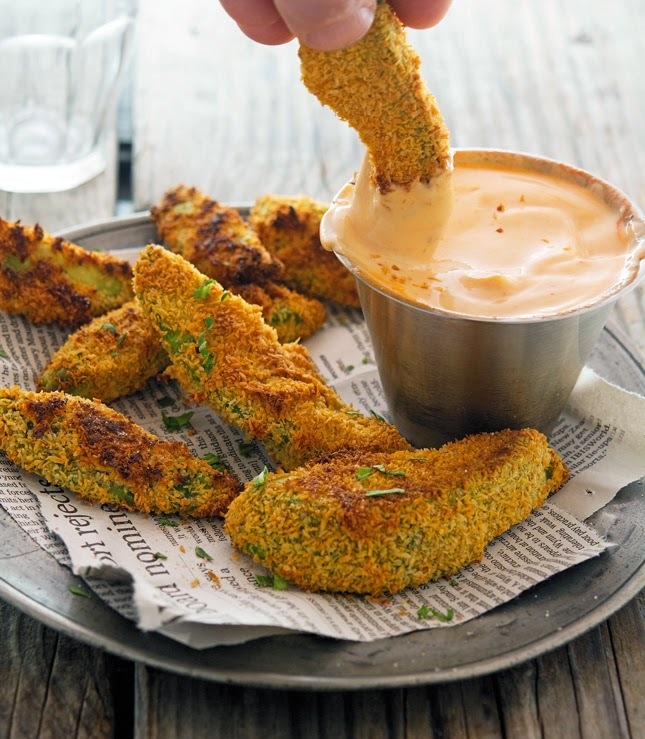 You have to give avocado fries one more chance. They're that good! I'm not a huge fan of avocado tempura, too greasy for me. This is completely different! 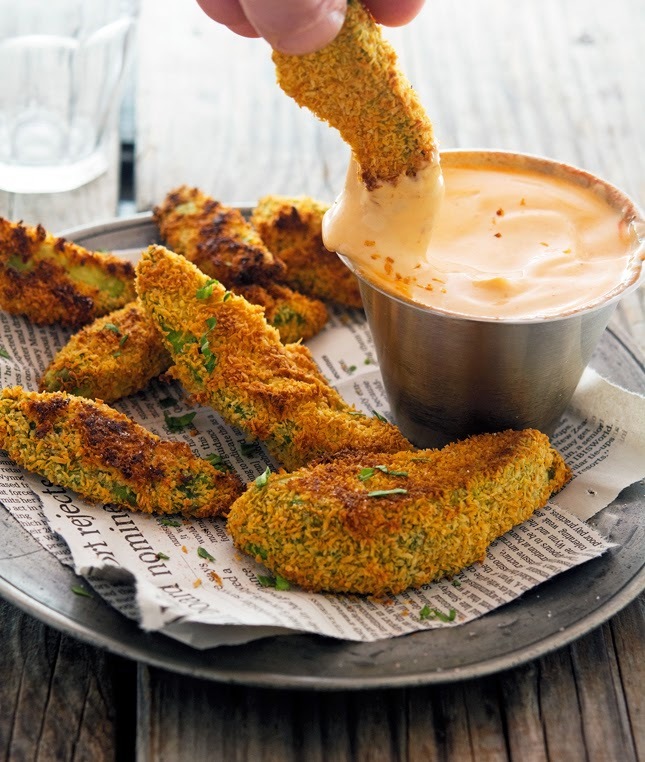 I have just started getting on the avocado fries bandwagon and will definitely be trying this one out! LOVE the recipes, keep 'em coming! Mike, this is just genius. Loving the idea. My boys love avocado, if I make them these..it will be like the best for sure. Happy Friday. I'm sure they'll love these, they're sooo good! oh wow- Not going to lie, I may have had the same expression as your sister but that may be because I had a bad experience at a Japanese restaurant with a tempura version! This looks delicious and I'm not going to lie- I want to eat the mayo but the spoon! This is totally different from avocado tempura. You should give it a try! You won't be sacrificing an avocado, trust me! I'm bossy when it comes to food. That's the kind of brother I am! I've never had avocado fries before, but they sound completely amazing, especially with that Sriracha Mayo! They're really something, I'm telling you! I have never seen anything like these, but they look amazing, I could take a bite right now. Hey Mike! love your website! Quick question.... Can you sub the arrowroot powder for Almond or Coconut flour? I'm going to give this a go! How did it go with the arrowroot substitutes? what could you replace with egg if you're vegan? could you use flaxseed mix? Did you ever try using a flax egg? Looks outstanding. Going to try organic coconut flour instead of arrowroot. Cheers. How did the coconut flour work for you? I'm not a fan of coconut flavor, anything else I could use? My husband and I both thank you for posting this amazing recipe. We're not following a paleo diet, but one that it very, very similar in many principles of what you can and can't eat, and unfortunately for us, whereas 'main' meals are brilliant and varied, often a decent 'side' is lacking, when you've ruled out pasta, potato, sweet potato, rice, jacket potato, fries, fries, fries, did I say fries? tortilla, bread ;-) There's only so much cauliflower I can handle. Anyway, these tasted absolutely brilliant. These tasted how I hoped they would taste, after reading the ingredients list. And although my husband did look dubiously at them when they came out of the oven (so it's avocado, and... coconut...?) he is a convert for both the fries and he loved the sriracha dip too. Happy here! Avocado sales will be going up in the UK! Many thanks!